"A beautiful fall dish that packs cut acorn squash with a sweet blend of orange juice, apples, pecans and Marzetti® Old Fashioned Caramel Dip." Preheat oven to 350 degrees F. Butter a shallow baking pan and add 1/4 cup water. 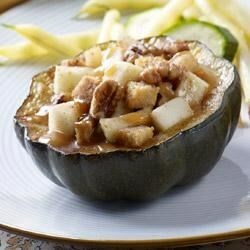 Place acorn squash, cut side down, into prepared pan. Bake 30 to 40 minutes or until squash is tender and easily pierced with a fork. Remove from oven. In a medium bowl, combine butter, orange juice, spice, apples, pecans and bread and toss well to coat all. Spoon Marzetti Old Fashioned Caramel Dip into each squash shell and spoon mixture into squash shells. Bake for 20 minutes or until lightly brown. Serve warm.